Fish and Wildlife Service has taken the first step to remove Endangered Species Act protection from grizzly bears in the Northern Continental Divide Ecosystem, releasing its Draft Conservation Strategy for public comment. Click here to read our summary assessment of the Conservation Strategy in our Summer 2013 newsletter! Click here to read our detailed letter to Fish and Wildlife Service. Click here to access the Draft Conservation Strategy. PLEASE ACT NOW: The Conservation Strategy would remove legal protections of grizzly bear, remove habitat security protections, and decrease the NCDE grizzly bear population through sport hunting and relaxed mortality quotas. 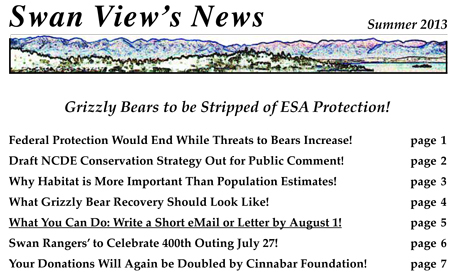 The NCDE and Yellowstone populations would be “de-listed” from ESA protection though they number less than 1,000 and 600 respectively, are no longer biologically connected, and in spite of research showing some 5,000 bears must be well connected by secure habitat within and between the remaining six Recovery Zones in Montana, Wyoming, Idaho, and Washington! Read more in our Summer 2013 newsletter. Its table of contents is shown below.